The Lime: Look nuh MySpace soca is a genre too!!!!! 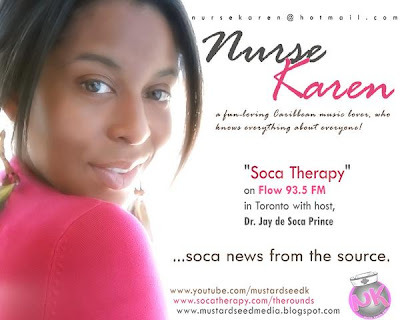 Kudos to Nurse Karen who officially launched a campaign to get MySpace to officially list soca as a musical genre on their site. · The creation of a MySpace Caribbean regional English-language sub-site. At present, MySpace considers the Caribbean to fit under the umbrella of Latin America. Therefore Caribbean users often login to into a Spanish-language interface featuring the latest in Reggaeton and Latin Pop. Organizers believe that the end result of the above recommendations will create a win-win situation for the soca music industry, fans and MySpace alike. Artists already use site, but they have to describe their sounds as Reggae, Tropical, Fusion or Zouk. I have already seen Jam Band too. There is no category that represents them. As a result, Soca artists never have the chance rise to the top of MySpace music charts. Soca is way bigger than that, so the time is now for a change." The non-partisan campaign, officially endorsed by (Nurse) Karen (Etc), Soca Therapy, Canada's #1 Soca radio program, and Mastamind Productions (Soca Producer/Composer) asks for the grassroots support of all Caribbean media outlets, entertainment professionals and music fans.